I’m always in search of new recipes, always. I always find myself with some strange turnips in the fridge, or a cut of meat I’m not familiar with, or with simple lack of inspiration! In the last years I’ve realized that even if I love so much my cooking magazines, after a while I don’t look at them anymore: the lack of a digital index, easily searchable by keywords, makes them obsolete after a short period of time. For my favorites I’ve switched to the digital edition, but when I look for inspiration my only source is the Internet. BBC Good Food: in search of the perfect scones recipe? Or the latest take on a Shepard’s pie? Or for a simple and quick way to cook chicken breast of a fish fillet? 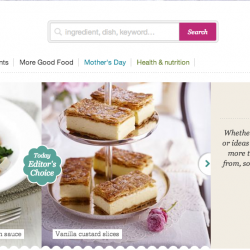 Don’t look farther, as BBC Good Food has a wonderful archive of thousands of recipes searchable by keyword and they can also be filtered by time or course or even calories! The recipes are all tested both in the tasting kitchen or by the readers, so are 90% fool proof (there is always a 10% possibilities of failure). Simply Recipes, by Elise Bauer: she’s one of the first food bloggers I’ve ever read and I know for sure, having tried many of her recipes, that they are not only very simple and well described, but fool proof! She has wonderful archives searchable by ingredient, so whenever you fancy chicken or chocolate, you’ll sure find something. 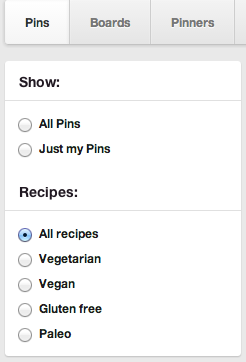 Pinterest recipe search: try to search something on Pinterest and be aware of the box the appear in higher left part of the screen: you see? All recipes? 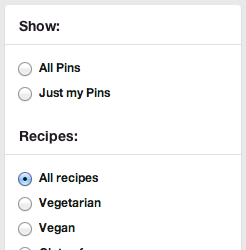 Click it and you’ll get only recipes! And there is few customizations too. It’s not secret I’m a huge Pinterest fan, and as it is a visual pinboard it’s like browsing millions of magazines, all in one simple search! And do not forget to be brave and confindent!